Julie London speaking in a classroom in Southern California. She is pictured here holding a mold which she engineered for all of her sculptures. Christmas 1997 - friend Mary Jayne helped us with the labeling and shipping 'department'. The Studio was originally named "Second Story Studios" after the song lyric, "I'm going back to essentials---a chair, a lamp, and the book that You wrote for me." Merna continues to house, inspect, touch up sculptures, communicate with and ship sculptures directly to customers. Years ago, our friend Rich Brimer surprised us with photographs from Rome. 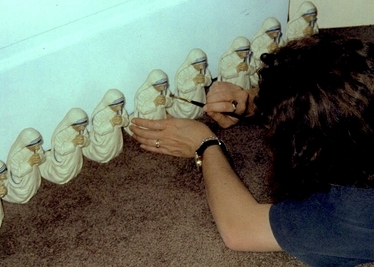 When I ventured into small business with a sculptor in 1994, I had no idea Mother Teresa would be on the horizon. But there she was; one morning in the studio, clay warmed by the sculptor’s hands the night before, undoubtedly--- Mother Teresa. “In appreciation for Mother Teresa’s devotion to her life’s work”, said the sculptor. Julie, who at the time was considering 3rd Order Vows with the Franciscans stated, “It’s not for market.” It was just an evening of contemplative work. Julie had recently started back into business on an island near Seattle. Previously, she was known for miniature sculptures of cats and otters. Since that venture she had traveled across the US on a bus, studied the great masters of art, and was currently in active contemplation with the writings of the desert fathers. In the midst of the latter, I met Julie, and decided to assist her in miscellaneous ways with her start-up. Julie’s rental-home-studio brought together friendships formed from community-made food and thoughtful theological conversation. Originally constructed as a summerhouse—winters were worn in wool, with a wood stoked fireplace. Julie’s entrepreneurial mission was to produce rare-fine-quality art while creating jobs in the USA. We resisted the reality that to keep pace with the gift industry we would have to go overseas with manufacturing. Julie sculpted, researched materials, and engineered molds. She taught me her technique for casting and painting the sculptures. Along the way, I kept office detail and shipments to customers in process. As you can imagine, the space was alive with creative attention. Working with our hands was an intentional life-work choice that allowed for laughter as well as focused quietude. Time passed with the work, and in January 1997, Julie needed to make a decision as to the studio’s viability. Working within our stateside framework for production, the option was to close, or not to close. Julie did not want to sell her sculpture of Mother Teresa, but many had seen the piece and requested to buy it---reflecting a desire for the work. Julie’s step-dad offered to purchase Julie’s original sculpture of Mother Teresa if it would provide funding for her to finish the piece and offer it to the public. There are not many photos from this era of the studio, but I remember clearly the afternoon that Julie brought her delicate sculpting tools and clay model of Mother Teresa to the table. In carving the details of Mother Teresa’s face and hands I could see Julie’s inward struggle to accept the offer or close; Julie was sculpting her way through the decision. In all of my years at the studio, that one afternoon with Julie and her sculpture was one of the most memorable, and I would say, the most sacred of hours. As I watched Julie extend her arm to that little sculpture, I saw what at first could be a face off between two women. Instead, I witnessed what seemed a non-resistant participatory act of necessity and camaraderie extended back to Julie by Mother Teresa. Both the Saint and the Sculptor seem to realize that though it made little sense, this little image bearer was called into existence. Naming it “Remember the Poor,” Julie made an essential decision that day, to offer her personal piece of Mother Teresa as a shared work. Engineering a mold, Julie cast and painted a few replicas. Choosing one, she photographed it and designed two small advertisements. 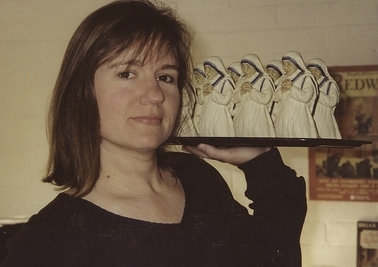 Julie introduced her 6” sculpture of Mother Teresa in the April 1997 issue of Collector Editions Magazine and the August-September 1997 issue of Inside the Vatican Magazine. As I write this story, I am stopped by wonder. It is now 2016; we know that Mother Teresa died September 5, 1997. But on that day, it was unexpected, and had great impact. I remember the sound of the studio telephone ringing as if it was the tolling bell of a global cry. Months after Mother Teresa’s death, Julie and I learned that Mother Teresa had seen the sculpture. A priest in the Northeastern United States had gifted the sculpture to some Sisters in hopes it was something they would not give away. 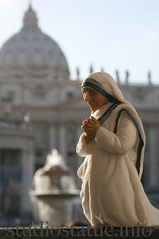 However, when the Sisters learned that Mother Teresa was visiting New York, they wanted to bring her something, so they brought her the sculpture. “Is that really how many wrinkles I have?” Mother Teresa said, as she held the piece and touched it’s face. One Easter, years later, I went to the Bronx, NY to meet the Missionaries of Charity in person. Sister Leticia was gracious to listen to me as we learned about each other’s work. Having a hunch that Mother Teresa would not have taken her sculpture back to India, I asked if the piece Mother held was on site. “Yes, it is,” Sister replied. Retrieving the relic from the convent prayer room, she placed it in my hands. Holding this piece and looking into its face was mesmerizing even to me. Though I had cast and painted a few hundred pieces, this one had a life-likeness that caught me off guard. I could have spent hours with it. On Mother’s Day this year, I am struck by the reality that in a small but present way, Mother Teresa has been with me every day since her passing. That first edition, made from our studio, holds many stories. But the second edition, eventually produced off shore, holds even more guidance stories than the first---stories I will someday write.